To send any payment, Bitcoin requires you to pay a minimum transaction fee. If you pay too low a transaction fee, your transaction might never be confirmed and will become stuck in cyberlimbo. Here you will learn the answer to this common question: “What is the minimum Bitcoin transaction fee?” You can skip to the Bitcoin Minimum Transaction Fee section if you just want the numbers. Before we get to that, it is helpful to understand the history of Bitcoin transaction fees and why there are fees in the first place. There is widespread confusion around this topic because – originally – fees were optional. You didn’t have to spend any more than the transaction amount itself in order to get your transaction confirmed. But not anymore. So what changed? In the beginning, Bitcoin transaction fees were viewed as a voluntary tip or gratuity given to a miner as a ‘thank you’ for confirming the transaction during the normal Bitcoin mining process. Miners did not actually need these tips, because the miner was already generating lots of Bitcoin by mining blocks. However, because miners are able to choose which transactions to process, there is incentive for them to process only those transactions which include a fee. Miners can decide to ignore Bitcoin transactions without fees, or with very low fees, and rather work on transactions that give them extra reward. That could be argued for, but it’s not the full story. In fact, transaction fees were built in to the fabric of the Bitcoin protocol from the start, and this is what we are seeing emerge today. Around the year 2140 there will be no mining reward for Bitcoin miners, making transaction fees the only reason to carry on mining. This is explained better here. So there’s that answer. Essentially, the Bitcoin mining network will reach a point where there are no rewards for a miner besides fees, which leads to the inevitability of a minimum transaction fee. There are also other reasons why transaction fees have changed from being entirely optional, some of which involve technical challenges that Bitcoin faces like the tricky blocksize limit debate. When Bitcoin is fully compatible with SegWit2, the minimum transaction fee is expected to come down to a more sane amount. What is the minimum Bitcoin transaction fee that is not too low? The minimum transaction fee is dynamic and can change over time. Thus, the best way to calculate Bitcoin transaction fees is by doing fee estimation using information provided about the Bitcoin network. See the Bitcoin transaction fee charts at bitcoinfees.21.co to figure out your confirmation delay times for different fees. The charts show the expected delay time for a range of low to high transaction fees. 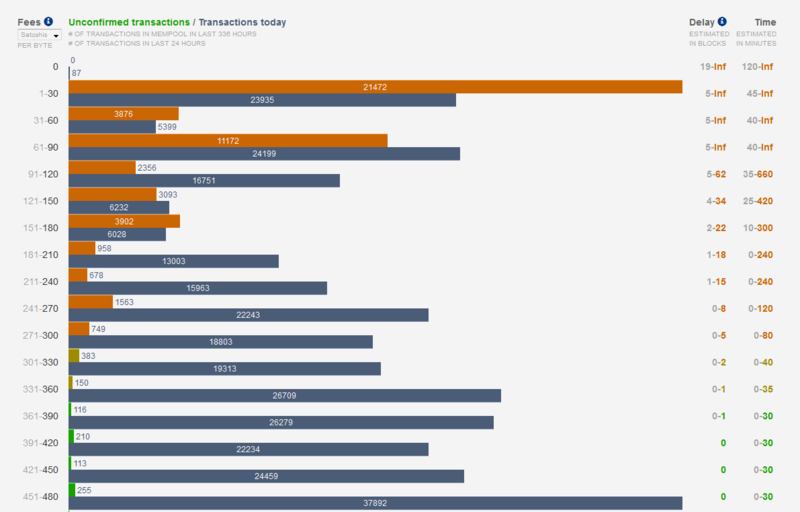 See the average Bitcoin transaction fees going through the network at satoshi.info and go with the flow. See how many Satoshis/KBs you need as a transaction fee to confirm within 1 block, 2 blocks, 3 blocks, 6 blocks, or more than 6 blocks at bitcoinfees.github.io.